Did you ever wonder if ventriloquism could: Help you get a better deal on a new car? Improve your pick-up lines in a bar? Save the ozone layer? Stop a thermo-nuclear war? The answer to all of these Big Questions is "Yes!" And these modest goals are just the beginning. 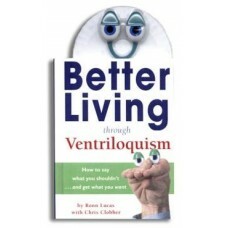 In this wonderful little book you'll find all the ventriloquism know-how and how-to's to get you out of any tricky situation--as long as your hand does all the talking. With practice scripts, real-life scenarios, and a starter hand puppet, Better Living through Ventriloquism will help you get that great job, take charge of any situation, and generally improve your life and that of the world around you. 128pp, 4-5/8" x 6-1/4", hardbound with fingerpuppet included. Suggested Retail is $12.95. Order now for only $10.00!